The XC40 T5 plug-in hybrid pictured. The Volvo XC40, a stylish and handsome car with a magical and fantastic interior, will get a fully electric version before the year is out. I have absolutely no objections to this. At a Volvo safety event in Gothenburg, Sweden, last week Automotive News Europe learned that the company will reveal a full-electric version of its compact crossover before the end of 2019, though additional details were not provided. Both the XC40 and the Polestar 2 use the small-car Compact Modular Architecture that Volvo developed with Geely. We first saw the CMA platform in 2016; a very versatile platform that could support a battery-powered electric car. And along with the platform, we also saw the 40.1 and 40.2 concept cars. The 40.1 ultimately became the XC40. 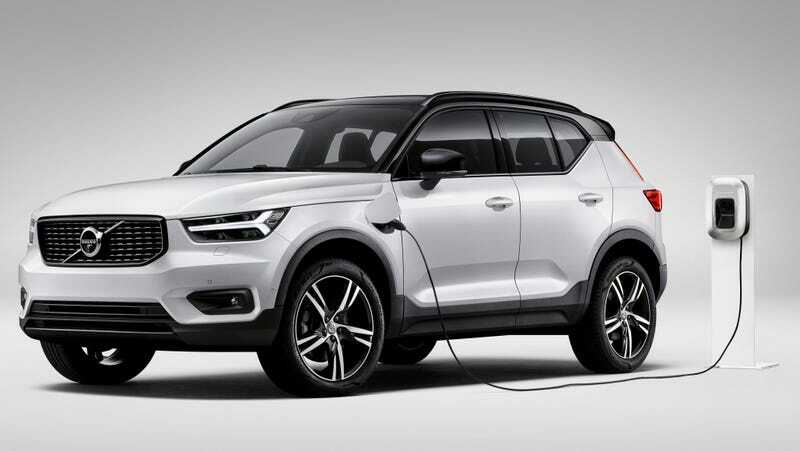 Rumors from the beginning of 2018 said that Volvo’s first electric car would be a hatchback and then followed by an electrified XC40, but now it seems like the XC40 is coming first. Volvo appears to be going the Audi route, which is shipping an electrified SUV/crossover first before any other body styles. Volvo has claimed that it wants to sell a million electrified cars, globally, by 2025. This is likely the first step towards that goal. We have reached out to Volvo for comment and will update if we hear back.